The ScenoProt project has analysed the nutrient composition and the most typical bioactive compounds of high-protein plants. Analyses aimed to identify the amount of proteins, the amino acid composition, fibres and the concentrations of phenolic compounds that act as antioxidants. The study analysed quinoa, lupine, faba beans, flax, buckwheat, hempseeds and rapeseed press cakes. All samples were commercial and mainly of a Finnish origin. In addition to whole seeds, the concentrations of peeled seeds and seed peels were analysed from certain plants. "Due to their versatility, these plants are healthy and rich in nutrients. In addition to proteins, they provide plenty of fibres, minerals, vitamins, antioxidants and other healthy bioactive compounds. For example, lupine, a fairly unknown plant, contains high amounts of proteins, fibres and phenolic compounds", says Pirjo Mattila, principal scientist at the Natural Resources Institute Finland (Luke). 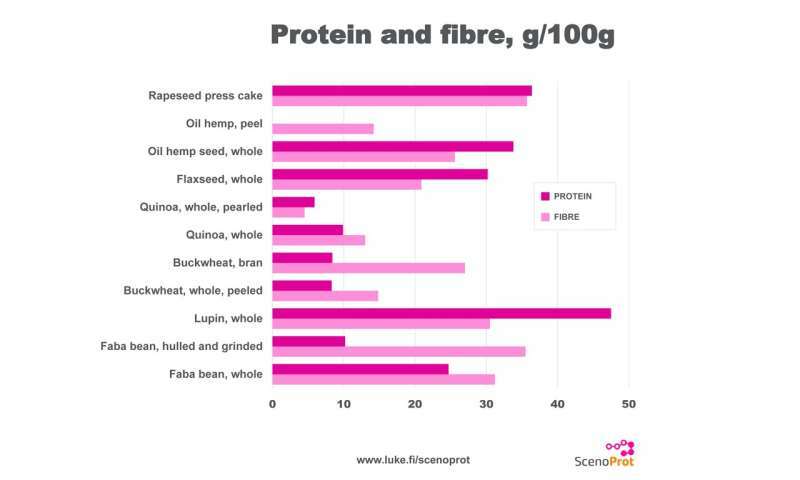 The highest protein content was found in rapeseed press cake (35.7 percent), produced as a by-product in the oil pressing process, faba beans (whole beans 31.2 percent, hulled and grinded beans 35.5 percent), lupine seeds (30.5 percent), buckwheat brans (27 percent) and hempseeds (25.6 percent). The nutritional quality of proteins depends on the amino acid composition of proteins. Food must contain a sufficient amount of essential amino acids, as the human body cannot produce them. 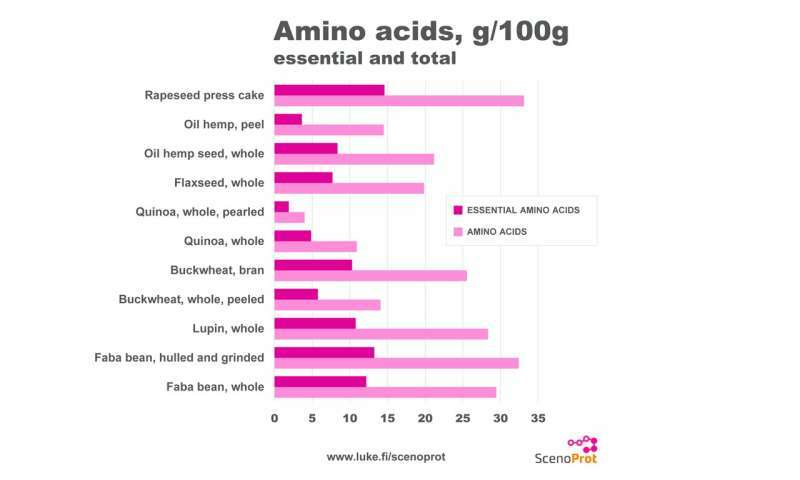 Buckwheat, quinoa and rapeseed press cakes have the most balanced amino acid composition. The study analysed whole buckwheat seeds and brans, i.e. the peel. Buckwheat brans contain more essential and total amino acids than the inner parts of seeds, whereas the inner parts of hempseeds contain more proteins than the peel. Hempseeds are used both as whole and peeled seeds. In addition to proteins, a nutritionally high-quality plant source of protein should also include dietary fibres that make the digestive system healthier by increasing the mass of faeces and by acting as a culture medium for valuable microbes. Fibres have been proven to decrease the risk of intestinal cancer. Lupine is clearly the best source of dietary fibres with its fibre content of 47.5percent. Rapeseed press cakes, hempseeds and flax are also rich in dietary fibres. Whole quinoa seeds contain not only more proteins, but also more fibres and minerals than peeled seeds. "The outer layer of quinoa seed is rich in nutrients. Slightly toxic saponins are removed from quinoa seeds by pearling, but their high nutrient values could possibly be maintained better if they were washed", Mattila says. The concentrations of phenolic compounds were also analysed from plants. Significant phenolic compounds include phenolic acids, flavonoids and tannins that are effective antioxidants. Plant-based phenols obtained from nutrition have been studied to reduce the risk of lifestyle diseases, such as cardiovascular diseases, the metabolic syndrome, memory disorders and type 2 diabetes. Condensed tannins are highly effective antioxidants. Their concentrations are the highest in faba beans, buckwheat, hempseeds and rapeseed press cakes. "Tannins also prevent proteins and iron from being absorbed in the human body, but this seem not to be a problem in wealthy western countries, where the health effects of tannins are more pronounced than their antinutrient effects", Mattila says. The ScenoProt project aims to develop a better protein system to help to mitigate climate change and to improve national health. The analysis of plant-based raw materials is one part of the extensive study, approached from the perspectives of primary production, consumers, markets and policies. Higher demand for special high-protein plants would diversify cultivation and offer new opportunities for farms, food processing and exports. Consuming more vegetables would also improve national health. During the ScenoProt project, three scientific articles on the nutrient content of high-protein plants have been published. Analysis results are saved in the Fineli database of the National Institute for Welfare and Health.